For those of you who had a February break, we hope you are feeling rested and ready for March. For those of you that didn’t… HANG IN THERE! April is just around the corner, or maybe down the corner and a little further down the street.We hope this week’s post gives you a jolt of energy as many of you are moving into character units. This week on chartchums we are going to examine the great teaching and charting work of a first grade teacher: Molly Hobbs. Molly is a teacher at the Taipei American School in Taiwan. Walking into her classroom feels a lot like walking into a warm hug. Besides maintaining a lovely environment of respect and kindness, her students have reading workshop routines down pat, baggies exploding full of books, and a great love of books. When I first worked with Molly, she expressed concern around student comprehension. 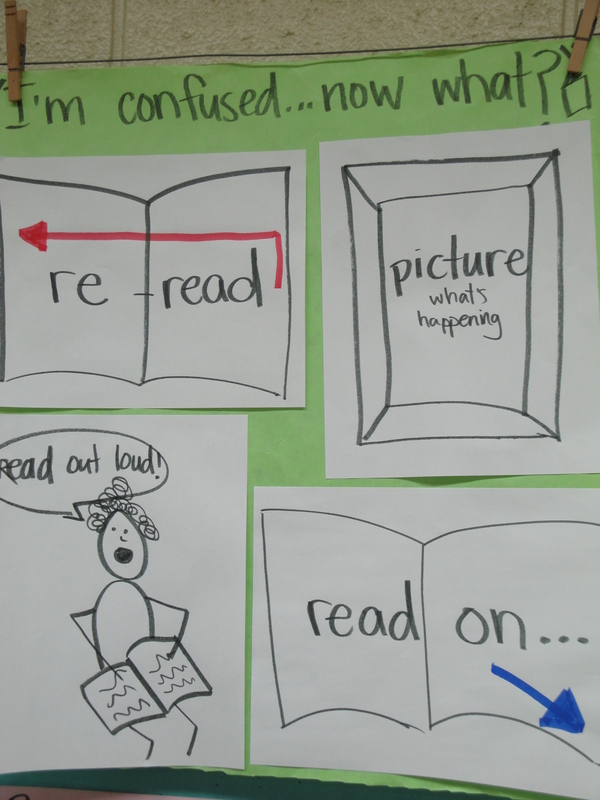 She felt, as many first grade teachers do, that students were so focused on reading the words RIGHT, that they were not doing the thinking work that truly defines reading. Now, one month later, the class has just completed a unit on character, which Molly adapted to address the comprehension needs of her readers. Charts are an easy and supportive way to let children in on the big goals of the unit. Oftentimes the headings name out the big goals. In this unit you can see that Molly had three big goals for her students, renamed in child- friendly ways. 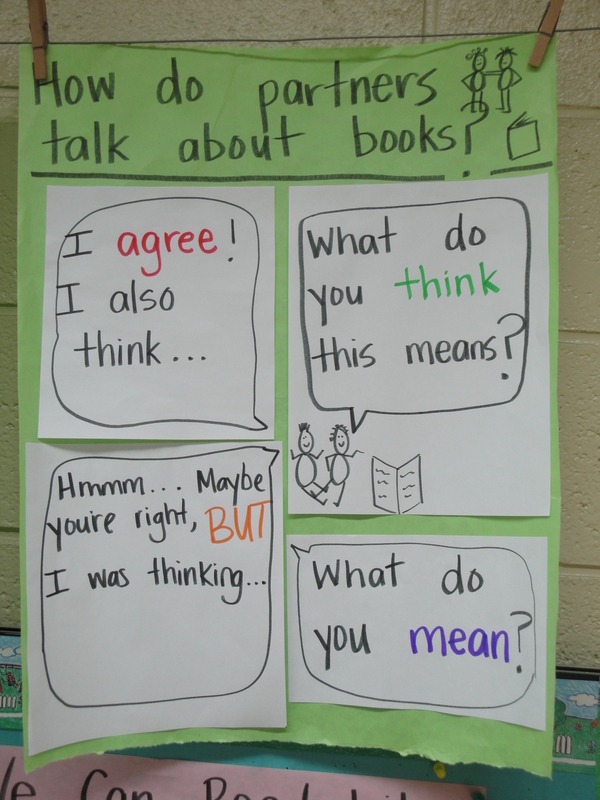 Child friendly heading: How do partners talk about books? Child friendly heading: I’m confused…now what? As Molly moves away from this unit, she might take small photos of specific charts and give them a to a few readers who need to continue working on that goal. Perhaps a few children need to continue to monitor, and others need to work on inferential thinking. 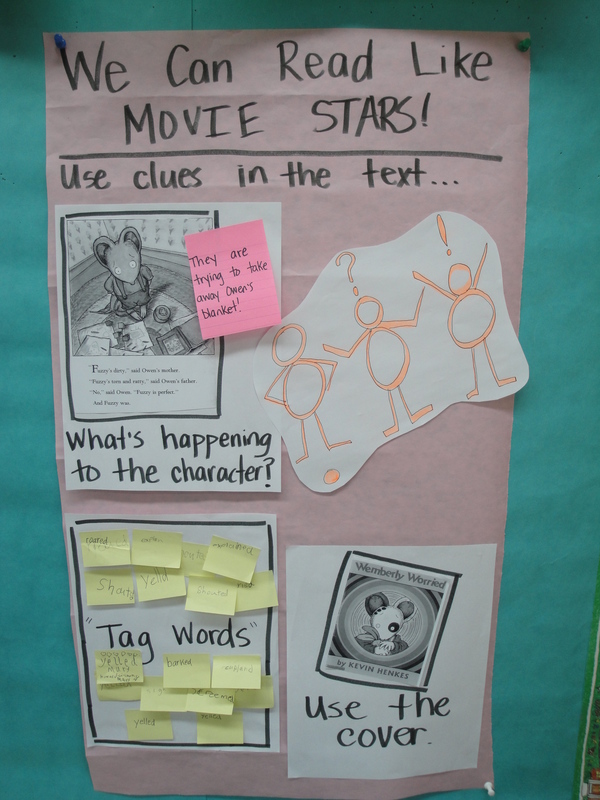 The small photo can go right in or on their baggy as a reminder of the work they must do as readers. In some schools teachers are required to post student names and the goals they are working on. A more flexible and easy way to do that is to have children put their names on post-its and then place them on the charts that have the strategy they are really focusing on for a period of time. 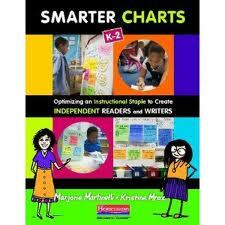 Molly’s charts underscore a few of the key components in making charts accessible for all students. Molly uses a combination of lovely visuals on her charts. One thing she has done particularly well is integrate them with the words to create more meaning. The speech bubble that says “read out loud” both states the strategy and shows it through the use of the speech bubble. 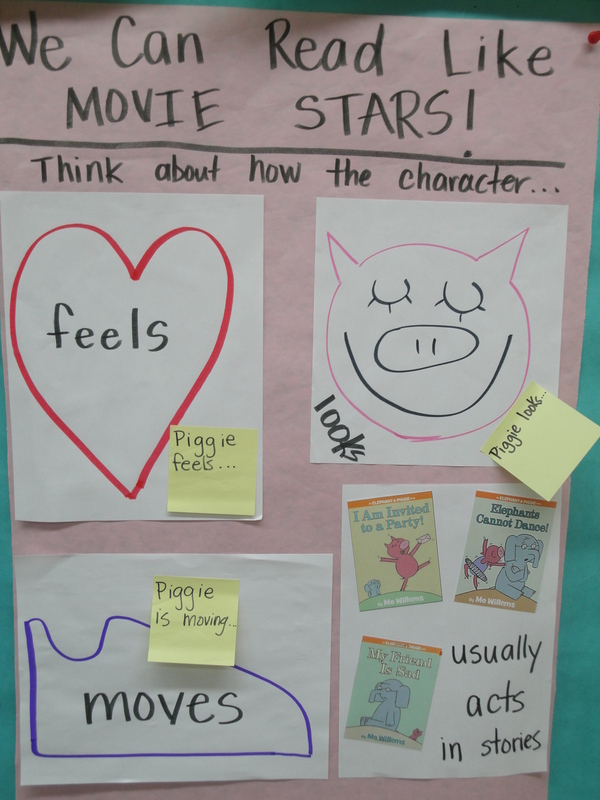 Molly has also effectively used well known texts on these charts: the Elephant and Piggy series by Mo Willems is a perfect example of how characters can act the same across books. Molly also knows this series is near the reading level of many of her students. Finally, some visuals are provided by the students. If you look closely at the tag words you will see that students have posted some of the tag words they have found in their texts, like whispered, asked, and screamed, to name a few. Molly has done a beautiful job of keeping the charts attractive without becoming busy. She has even split up one goal into two charts to ensure students are not overwhelmed when they look at the charts. She uses color effectively to isolate and identify different strategies. Additionally, all the visuals and language are in the service of the students and the work they need to do. It is easy to get carried away with just one more color, or one more picture, or one more SOMETHING, but Molly has struck the perfect balance between attractiveness and useability. At the end of a unit, the charts you have created with your students should serve as a roadmap for the hard work of the past 4-6 weeks. We can see the smart teaching Molly has brought to her students through this unit on character. The students now have more strategies for inferential thinking, working at higher levels with partners, and monitoring for meaning. Because her students had been so focused on word solving, Molly chose not to highlight that aspect of reading in this unit. Next year’s class may work in an entirely different way, which is why at the end of this year Molly will keep photos, but let go of the actual charts. To use them again would sculpt the class to the teaching, rather than the teaching being formed by the class. Thanks to Molly for opening her classroom doors and for being such an inspiring kind spirit, and thanks to everyone for sending your love and support to us for the past 6 months! Some of you have been asking for updates on the chart book we are working on, and so we are happy to tell you the manuscript for Smarter Charts is now done! We will keep you posted with details as they come in. We will see you again next week, until then: Happy charting!